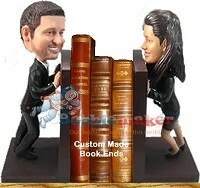 We’re always looking for ways to expand our already extensive collection of custom bobble head dolls. In this section, you’ll find all the latest and greatest designs we’ve added to our collection of custom bobbleheads. So, if you’re unsure what kind of custom bobble head doll you’re looking for, this is a great place to start. This collection reflects new selections from across our many different categories of custom bobble head dolls. So, search away! Newly added designs for you to choose from. We keep expanding our sample made body design base to keep your costs down. Check back frequently. Once you’ve picked out the brand new custom bobble head doll that you want to work with, the fun is just beginning. When you send us a picture of someone who’s likeness you’d like to use, we’ll completely customize the brand new bobble head doll to match that person’s image. That’s why these custom brand new bobble heads make perfect gifts for any occasion you can think of, but most especially for birthdays and special events.